Plumbing Masters NW is now Plumbing Experts NW! A great NEW name, same AMAZING service! CLICK TO GET YOUR $50 OFF COUPON NOW! Try Our Service At A Discount! Examine Your Sewer Line with a Sewer Scope Lynnwood! Find Out Exactly What is Causing Your Sewer Line to Back Up! It seems that more and more homeowners know about the value of a "sewer scope", also known as sewer camera video inspection. Clogs and stoppages in your home's main sewer line can happen for a wide variety of reasons. Some sewer line backups can happen due to simple build-ups and after a drain cabling or jetting, you are clear and ready to go for some time. But in many cases, your sewer line may be old, made of materials that break down (especially if your home is older than 1980). Also, root intrusion from surrounding trees can compromise the flow of sewage and break apart your line at joints, even with a new sewer line material. The bottom line is that you cannot truly know what is causing clogs unless you actually SEE it. A sewer camera inspection helps you do exactly that and even provides you with a DVD copy for your records. We have experience, and for a sewer scope Lynnwood WA homes will certainly need, there's no better place to turn than the experts at Plumbing Experts NW. Of course, the video doesn't do all the work itself. You definitely want a sewer technician you can trust for a proper diagnosis of what they are seeing (much like a doctor during any medical exam), and to give you clear options for how to perform sewer repair or other actions. Contact us NOW - Fill Out This Form! Reviews of our Plumbing and Lynnwood Sewer Repair Work! We handle any Lynnwood -area plumbing problem that arises: Tubs, toilets, repipes, disposers, water pressure & more! Many times you cannot be clear where your water leaks are coming from. We can help locate leaks and fix them fast. Sewer lines are buried underground, so we help you know EXACTLY what's going on with sewer video inspections. Having issues getting hot water? We will repair the problem or replace your water heater. We also have tankless options! Plumbing Experts NW can clear any clog in Lynnwood, whether it's in your kitchen sink drain, your toilet, or in your side sewer line. Sewer lines can be tricky to diagnose and clear out. 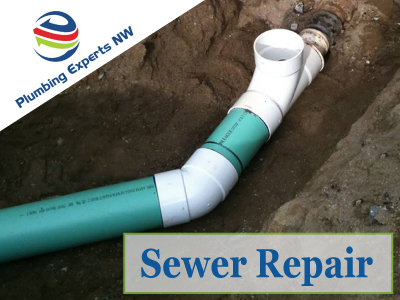 If you need it, we know sewer repair in Lynnwood and can that as well.